NEW DELHI: A photo clicked by Bengaluru-based photographer Ashish Parmar has been selected by Apple to be featured in the company’s advertisements. 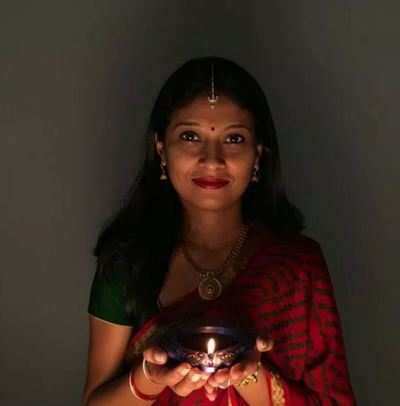 A candid shot of his wife, Raina Nanaiah, holding a diya in her hands has made it to the company’s billboards across the globe. It all started on festival of lights Diwali in 2015, when Parmar took a random picture of his wife in a red saree with purple diya in her hands. He later posted the picture on Instagram with hashtag #ShotOniPhone6S. Few days later, Parmar, who is a professional wildlife photographer, rec eived a call from technology giant Apple informing him that his picture has been selected for the company’s “Shot on iPhone” campaign. The picture now adorns Apple billboards across the world. The picture is reportedly one of the 53 photos shot with the iPhone 6S and iPhone 6S Plus — that have been selected from across the world as part of Apple’s ‘Shot on iPhone 6S’ campaign. Parmar happens to be the only Indian to feature on the list.